Woman: Welcome to the Polygamer podcast, where gaming is for everyone. Join us as we expand the boundaries of the gaming community. Ken Gagne: Hello and welcome to a very special episode of Polygamer. My name is Ken Gagne and this past week in the United States, Canada, and perhaps other parts of the world, we celebrated Father’s Day, a day dedicated to acknowledging, honoring and thanking the men who made many of us the people we are today. Last year at this time, I celebrated Father’s Day by doing a video interview of my father. He is the person who got me not only into video games, but also “Star Trek,” science fiction, fantasy, and so many other elements of my life that have just permeated the person I am today and have shaped the course of my life in so many subtle and significant ways. This video was posted to my YouTube channel, which is all about video games, so that was the focus of the interview. We shot for about 20 minutes and then I paired it down to about eight minutes, put it up on YouTube, and was happy to have that memory of my father to share with everybody. In the year since that video went up, I of course launched my two podcasts, Polygamer and IndieSider. Polygamer is about equality and diversity in video games by representing a variety of voices that you may not traditionally hear in mainstream media. This year, I decided to revisit the topics that my father and I discussed in that video by having him as the guest on this week’s episode of Polygamer. Now, you may consider this to be a selfish topic. After all, Polygamer is supposed to represent diverse voices in the gaming industry and my father is a straight, white, cisgender male, of which there already is one on this show and on every episode of Polygamer, me. Then, my friend Rosie pointed out that if you, my listeners, are anything like me, then my father represents a demographic that you find just as inscrutable as anybody else I’ve ever had on this show. How many of us can truly say we understand our fathers and where they’re coming from? I know I can’t, but I think I do a little bit better after having conducted this interview. My father is presently in 70s, having been born in the ’40s. Over the course of this interview, you’ll learn much about what qualified as entertainment throughout all the decades of his life, as well as his opinions and perspectives on the gaming industry today, and the decisions he made that shaped men into becoming the gamer and podcaster I am today. He is the oldest person I’ve ever had on this show. In that respect, if no other, he certainly represents a diverse viewpoint. A couple of technical notes, this was my father’s first time using either Skype or a headset and also my own microphone that I’d been using for every episode of Polygamer recently died and I’ve been experimenting with some alternatives. I can tell you right now that after listening to this interview, you’ll agree I need a pop filter, so my apologies for that. Some other background, I was born in the 70s and I’m the youngest of four sons and my father and I may be discussing those siblings at some point. There will be links in the show notes to many of the items that we discuss, including the video interview that we conducted last year. If you want to find out more about father or any of the topics he brings up, go ahead and click on those links on polygamer.net where you can also find links to our Facebook, Google+ and Twitter accounts. Thank you for indulging me in this opportunity to get to know my father better. I hope you enjoy it as much as I did. Ken: Today I have the rare and dubious honor of being joined by my very own father, Mr. Edward F. Gagne. Hi, Dad. 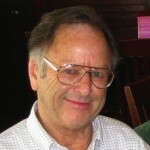 Edward F. Gagne: Hi Ken. How we doing? Ken: I’m good, how are you? Ken: Thank you so much for coming on the show. This is going to be one of the most unusual episodes I’ve ever recorded. Ken: Throughout the history of the show, I’ve interviewed strangers, I’ve interviewed friends, co‑workers, acquaintances, but I’ve never interviewed anybody who I know as well as you, nor anybody who knows me as well as you do. Ken: I’m a little worried about what our listeners are about to find out about me. Edward: Then let’s get started. Ken: I’m really curious to know all about your history with video games, the family’s history with video games. We talked a little bit about some of that last summer when I shot the video, but I want to go a little bit farther back this time, because you were born well before video games were even a thing. You were born during World War II, back in the ’40s. Edward: Right. That’s when television wasn’t even commercially available. Ken: Did you grow up in a household without television? Did you and your family just sit around the radio listening to radio shows, like “The Shadow”? Edward: Oh, absolutely. That was the highlight of the week. That was something. Ken: Was it a routine? You would have dinner as a family and then go into the living room and pile around the radio? Ken: What kind of radio shows did you listen to? I mentioned The Shadow, and I myself like Jack Benny. Were there other shows or serials that you enjoyed? Edward: Jack Benny, you even knew Gene Autry ‑ singing cowboy, Roy Rogers also was singing cowboy. Also good. Ken: You may have listened to radio shows, but those were maybe for an hour a day, or a week. What would you generally do for fun? You weren’t sitting around surfing the web, or playing Game Boy. When your parents said, “Go out and have fun,” what did you do? Edward: You always had Kick the Can. After weather permitting, you went outside, and you would put a can in the middle of a driveway. Somebody would kick it. As far as it could go. If you were the one that was…say “It,” You had to go run and chase it, and put it back in the center of where it was. Now, you would have to go looking for all of the participants, that you were playing with, and tagged them. If you found the all and tagged them all, then somebody else would have to take your place, and you would do that for hours on end. As boring, or stupid as it sounds today, that was fun then, and we enjoyed it. Ken: How many people would you play with at at time? Edward: There was one, two, three, maybe four or five at the most. You didn’t have a gang, say, of 10, or even 8, or something like that. I don’t think it went above five. Ken: These were all just kids from the neighborhood that you would get together of different ages? Edward: Yes. You would just go out in the middle of the yard, and yell, “Hey, we’re going to have a game of such and such, anybody want to come out and play?” They would come out, those that could, and that would start the came. The other thing, and I tell people this, they don’t believe me but it’s true, when we would get a torrential downpour would start off, and it’d be lightning and thunder, your grandfather, my father, he would give us all each a bar of soap, and send us outside to take a shower. We’d use the soap, and we’d soap all up, and everything. We’d be just in our bathing suits on the lawn, and soaping up, and washing up, and we’d be having a grand old time, in the pouring rain. If it happened to crack some lightning, we’d duck up against the house, or whatever, like that was going to protect us, and damn it that was fun in those days. Ken: Was he trying to save on the water bill by getting you to shower outside instead of inside? Edward: Yeah, that’s all it was, and it was fun. All of us kids enjoyed that. Ken: You just mentioned that my grandfather would have been put away for child endangerment, and nowadays there are a lot of things that parents are concerned about letting their kids do, or not do, like too much of television, or exposing them to video games when they’re too young, or whatever. Was there anything you enjoyed as a kid that was frowned upon, or which the older generation was concerned about? Edward: Not really. You got to remember radio was…our grandparents grew up with it we’ll say. That became commercially available in the ’30s, even in the late ’20s, but irregardless. Then when TV came out in the late ’40s, early ’50s, it was even new to our grandparents, so it was a new thing for them too, and not something that anybody looked at as addictive, or this or that, or whatever. A lot of people said, “Oh, there goes all the old movie theaters. They’re going go out of business now.” That didn’t happen. People still, they’d watch their TV. We would watch something at night. They have their prime time show, and then, believe it or not, because there was so little new content in those days they’d play it the next day, all day. Ken: Did your household get one of those early televisions in the late ’40s, early ’50s? Edward: Yes, we had one. It was like, I want to say maybe a 10 to 12 inch screen tops, and it had no horizontal or vertical control on it. You’d turn it on, and the screen would be just, it’d be scrolling, scrolling, scrolling, so there was a little handle on the side that you would slowly turn to so‑called “Adjust it,” and get it into perspective, whether it’d be horizontal or vertical. Ken: 10 to 12 inches, it’s just a little black and white set top box. You practically went blind looking at it. Edward: You had to get up very close. That’s where it came about that people said, “Stop sitting so close to the TV.” Well, this was after they got bigger and bigger, and you said it was just a habit from when it first came up, when they were so very small. You had no choice, that was the only way you could see it. Ken: Nowadays, we are living in such, those who can afford it like to have these luxurious living rooms that are spacious and thus, they need to have a 70‑inch televisions that when they’re sitting on the other side of the room, they can see it all. Ken: That’s quite the luxury that you didn’t have. Edward: Oh yes, that’s for sure. To other call it eras, I didn’t grow up in but we’re, they preceded me, one is the board game era. When you stop and think of it, the late 1800s and early 1900s where the epitome of board games, that’s when Monopoly was invented, if you will. You had an Easy Money, you had all kinds of other board games that you actually, in those days in the house, they had a huge box that will have all of these games in that box. As a treat to the kids, parents would say, “Go and pick out one game and we’ll all play it on the kitchen table.” That’s what they would do. That was their evenings entertainment. Then, you obviously had the puzzle era where the whole families and even neighborhoods, if you will, would get together and do 1,000 or a 2,000‑piece puzzle, and that was their another form of entertainment. That’s passed by. You go to some places where and I’ve seen it primarily in healthcare venues, where they’ll have a passionately done puzzle on what they call a puzzle table so that people coming in and they’re going to be starting a regimen of chemotherapy or whatever. They’ll be sitting there just for an hour or so and they’ll start picking up pieces and adding it to the puzzle. That’s about what’s left at the the remnants of the puzzle era. Ken: According to Wikipedia, both Monopoly and Easy Money came out in 1935 which would mean that they still would have been fairly new around the time you were born. Edward: Possibly, possibly. I thought they came out even earlier than that to be honest with you. Ken: I’m sure, board games in general are much older but those two particular ones who were right in the middle of the ’30s. Edward: Because you had Parcheesi in multiple levels that I can’t think of. Ken: Parcheesi, again, according to Wikipedia, dates back to the year 500. Ken: You’re not quite that old yet. Edward: I don’t think so. Ken: Jigsaw puzzles and board games, certainly their popularity have waxed and weaned over the years, right now, board games are actually becoming more popular. There’s a big story recently about tho game called Settlers of Catan and how the Green Bay Packers play it in their locker room between games. Ken: When that article came out, the game shop in Green Bay just sold out of every copy of that game. Edward: [laughs] I’ll be damned. Ken: In fact, a friend of mine and former guest on the show even produced an entire documentary all about the research and the popularity of board games. Edward: That I did not know. Ken: Board games unlike computer games, you have to get everybody into one place, but the cost of admission is much cheaper because everybody doesn’t have to have their own computer and you don’t have to worry about installing the latest version and getting on the network and installing updates. With the board game, everything you need is in the box. You just put it down, one person has bought it, eight people can play. In this very technological era, there’s some appeal to something that’s a little old school like that. Edward: Yeah, I can see that. A refurbished, old car that you’re just fond of, let me see what’s under the hood, or what size is the trunk, or jut curiosity. Ken: I found that a lot of people, speaking of cars, tend to when they get older, lust after the cars that their parents had when they were kids. What kind of car were you driven around in as a kid, or did your parents even have cars? Edward: I remember grandpa with a loader and a truck and things like that, but a car, there was one that was out of style, it’s like going out of the fishing now, they call it the Imperial that he had bought. It was supposed to be a luxury car, but it started falling apart right away. Ken: The Chrysler Imperial from 1955 looks like something you see out of an old…I’m sorry, it’s actually was produced 1926 and 1954, and it looks like something you see in an old Chicago gangster movie. Edward: Probably, probably. [laughs] Your grandmother would not even ride in it. It was so horrible. Edward: Oh yeah. She was a very, very introverted person when it came to, what will the neighbors think, what will this one think, and everything? She never wanted to make it look like she was putting on the airs. She wouldn’t even sit in that car. She’d like a plain vanilla envelope car, nothing ostentatious about it. Ken: You apparently never got a Chrysler Imperial as an adult but certainly growing up with trucks and loaders, that’s something you gravitated toward your own adulthood. Edward: Yeah, always like basic equipment. Keep it up, keep it clean, and keep it well‑maintained. Ken: Another medium that was popular when you were a kid is comic books and in the ’50s, there was actually a moral panic over comic books concerned about especially the genre known as crime comics or horror comics that went to corrupt kids, but there was a lot of good comics too, like Superman came out in the late ’30s and still around today. Did you read many comic books as a kid? Edward: I would say yes, I did. But now in those days, you also had…you would go and buy a comic book I think it was nickel, maybe a dime and you would read the whole thing in probably two or three times then you’d bring it back to another store sort of like today’s game stop and you’d swap it for another comic book for a nickel. You will keep doing that all the time. Ken: I’ve never heard of that, that’s interesting. Edward: Oh yeah. They weren’t the brand new hot off the press comic books at these prices, that they were someone else’s red tags and you just enjoy that. Ken: It’s not like today where somebody buys a comic book and after they read it, they put it in a bag and they save it and store it away until 50 years later becomes a collectible. You never kept your comic books, you just kept trading them and to read more of them. Edward: That’s right, exactly. Read more of the older ones. Absolutely. Ken: So you never had your own collection of comic books that you kept as an adult which your parents had to get rid at some point because you’re always swapping them? Edward: Unless, there was one that was unique to yourself that only you liked because you’s bring them back to these comic books swap stores and the owner would look at it first and say, “I give you three cents on it.” or whatever, and if you felt whatever he was offering you was really too cheap, you jut put it back in your pocket and you left. You collect and now you become the collector of that one book. That one kind of book. Ken: You were a collector of comic books that nobody want to read? Some people since they paid 50 bucks for it when it came out, they want more than a buck for it, they just say, “It’s not worth it.” They keep it. Edward: They don’t. Just out of spike. It’s just a continuation of something that started 50 plus years ago. Ken: Sure, interesting, just same practice, different industry. By the time Star Trek came out, I believe in ’66, you were in your early to mid‑20s, what was it that appealed to you about Star Trek of all the…by that point television had been around for 10, 20 years, there’s a lot more shows to choose from, what drew you to choose that one? Actually, I was just reading a couple of weeks ago how we are developing, or have probably already developed some type of engine that can break the speed of light. They have been using this term on Star Trek for it’s infancy. I’ve seen so they borrowed the name from Star Trek or the Star Trek inspired this engine and ion propulsion engine, does that sound familiar? Ken: Yeah, I’ve heard of those, the thing about ion engines I believe is that they may not necessarily break the speed of light, but they accumulate speed over long period of time and so given enough time, they can actually go extremely fast. Ken: Ion engines are actually something that’s also in Star Wars. You remember those enemy ships that the evil empire would use, they were called TIE fighters, TIE, T‑I‑E is short for twin ion engines. Ken: You’re right, scientists are still working on faster than light speed, some sort of warp drive that bends space around the ship. I don’t know that they’ve actually developed it yet but if for us to ever realistically visit the nearest star as if it were four light years away, we’re going to need to do something beyond just propellant like we’ve been using. Edward: What we have, exactly. Ken: Liquid propelling, I mean. Ken: But I like what you said about Star Trek being realistic because Gene Roddenberry it’s creator, used it as a way to address real world issues, it was a metaphor for a lot of things we were dealing with. There’s this famous episode called “Let That Be Your Last Battlefield,” and it was these two aliens, one was half‑black half‑white, and the other was half‑white half‑black. This was at the height of the civil rights movement, Gene Roddenberry’s trying to show in his opinion how foolish it was that we were arguing over skin color. The of course, Star Trek came back in the mid‑’80s and continued for 18 years with the next generation Deep Space Nine, Voyager, Enterprise, several movies. You were still interested at it even at that point because we watched all the shows together. Ken: Did you have a favorite series or character of all the different Star Treks? Edward: Boy, the series that had Picard in it was excellent, they were all good in their own rights, let me put it that way but I think this one here kind of rose above the rest. Don’t ask me for any specific reason because again, they were all good. Ken: Gene Roddenberry presented a very idealized version of the future where technology allows us to rise above war and crime and poverty. Do you think we’re ever going to be on a trajectory where we can have that kind of future in reality? Edward: No, I think that there will always be some type of conflict. I find that was one thing I noticed right away on all Star Trek episodes. They had translators around their neck or wherever they were. Translation of language was never ever ever a problem but you always had on board, what do you call them? A cultural affairs representative? Ken: Yeah, they had somebody serving as a sort of liaison or counselor. Edward: Yes, and that’s where the conflict was. The conflict was in the languages or things being misunderstood or misrepresented, it was always in the cultural nuisances, if you will, that would start things off on the wrong foot. They played, her name was Diane, that short girl are on Picard’s ship. Edward: Yeah, and she was their cultural whatever, and she played an important role in any negotiations or arbitrations, whatever. She was almost part of every single party that went off board to some other area. Ken: But even when intention was being understood the future Roddenberry envision had no conflict among humans but sometimes, there was interracial conflict where the humans and the Romulans might have different desires and it’s not a miscommunication, they actually would go to war. Edward: Absolutely, yeah. If you couldn’t fight over skin, because here on Earth, you have two main reasons to go to war, or three, religion, land, very important, or skin color. If you overcame those three issues here, and now you’re going to outer space, now you had all of these god ugly other species and that was good enough reason to fight, they have to go to war. That’s what you had out in outer space. Ken: Even if we overcome those issues on our own planet, we’re still going to find them among the stars? Edward: Absolutely, because even now, we say, if we try to communicate with sending out communications into the stars, and they say, “Don’t let them know we’re here.” What if they’re a whore mongering type species? Isn’t that a rhetorical question that even another specie’s receiving this inquiry could have? Don’t answer it, don’t answer the door. It might be the boogieman. Something to that effect. They were on both sides of that door. Ken: There’s a movie coming out this summer called “Pixels,” where the pioneer spaceship that we sent up back in the ’70s, I had a golden disc on it with messages from various cultures on Earth. Ken: In this movie, one of the messages on that disc were the video games that were popular back then like Don King Kong, and Qbert and the pioneer spaceship gets picked up in the movie by this alien race that misinterprets the message as a threat and they create real life spaceships based on those video games and send them to Earth to attack us. In this movie, there’s a giant Pacman going around the streets of New York City eating everything. ’40s, kick the can, ’50’s, comic book, ’60s, Star Trek, ’70’s, is that when you start discovering arcade games? Because that’s around when Atari was founded and created Pong. What was your first encounter with an arcade game? Edward: Of course, you had Pong on the computer, then you had that other game where it was like a worm that would go around and around the screen. Edward: Right, and every time you would do something right, it got a little bit longer and it kept going and going until it just outgrew with space if you will and you die. A lot of these computer, well as where they computer games, they got their origin from computers. Ken: Let’s back up for a sec, you were in early adopter of the technology known as the Apple II computer. You brought home an Apple II Wii, pretty much as soon as it was released in the early ’80s. Edward: Absolutely. You know that cost over $2,000 in those days? Ken: No surprise. At that point, you were heavily involved in the family business, was that your motivation to bring one of these machines home? Edward: At that time I would have to say, “No,” but then, I went to school nights and to learn how to do programming because they were, I figured, if I could learn the basic of programming, there was the new programs that came out called spreadsheets by this account. If I could learn how to use that, I was doing all of the paperwork for the business in those days with these big spreadsheets by hand and pencil, now, here you could do it on a computer and save it to a so called floppy disk, unbelievable. That was fantastic. We already had the computer in the house, that’s when I started to…I went to school at nights for probably two years and obviously it’s evolved into what it is today. Ken: If the business was not the reason you bought the computer, what was? Edward: Curiosity, I just knew it had down the road the road the potential to change the way we could our heck of a lot of different things. What that was, I don’t know. It’s like learning to ride a bike, you get on the bike, you go on, you come to the shell, you know you can climb it, but you have absolutely no idea what’s on the other side. But your curiosity urges you on to climb that yell and go over the other side and find out what’s there. Even if it ends up being nothing. But I knew that this computer had potential for something and what was on the other side of it, I wanted to find out. Ken: That’s a really interesting metaphor because you know what Steve Jobs originally want to call the Macintosh? Edward: No. That would have been a very good one. Ken: I’m glad they talked him out of it. I grew up in a household that had the Apple II and there was an Atari 2600 as well, and you brought these things home because you were fascinated by them. What impact did you think they would have on your four kids? Were you hoping that they would be getting in on the ground floor these new technologies or was it just going to be another toy? Edward: Oh no, I was hoping that you guys would learn to…in other words, I could figure out their potential for my personal use, but I was hoping that you guys would figure out the potential for your use. It did, each one of you became proficient in your field with them. Ken: I understand that was quite unusual if I recall correctly the high school that my three brothers and I had a keyboarding class but you had to fight to get my oldest brother into that class. Edward: The computer keyboard is nothing but a typewriter keyboard, same, if one fits right over the other, all the keys are located in the same exact spaces. Now, they had only a limited supply of these keyboards in the high school call it typing class. They were just how bent on preserving any open slots jut for the girls because that was typing, that was secretary, that was going to be their future jobs. If you took up that space, you took up their job in the future. They wouldn’t let you in. I had to go to the school and to the classroom, tell the teachers, say, “Hey, you let my son in to learn this, where the keys are and everything like that.” That sink in so they alternately did. I relented, and then you guys even found different encyclopedia sites that that where you got information for different assigned papers and you typed it all out, and you gave it all a correct recognition. Ken: We cited our sources. Edward: Right, but now, you also had, I will say “Auto‑check” in those days. The teacher, professor, the nun, whoever, whatever which say, “Well, you’re cheating, if that thing’s doing all of the typing for you, you are not learning how to type. That thing is doing it for you.” You have to type it all up first, and then even auto‑check to make sure of all the spellings. Then hit auto‑check. That was just a third backup if you will. They didn’t like that. We had to argue over you could not…one nun threat to even flank any student who handed in a paper that was then on a computer. We fought over that. There was always something to bring it into this modern age. Ken: I remember in third grade, I was probably one of three kids out of 20 in the entire class who had a computer and they said, that would be an unfair advantage over the other kids. I had to hand write all my papers and then a few years later, tipping point was hit and more kids had computers that didn’t until now at the point where teachers don’t accept handwritten papers, it’s gone from one extreme to the other. Edward: Right. Now, they’re lamenting that we’ll say the slow lost of script writing. That is going the way of the horseshoe and what do you do about that? Ken: There even some studies that show that students who still know cursive writing get higher SAT grades, but whether that is a correlation or a causation remains to be seen. When you said that we found these encyclopedia sites that obviously predicts the Internet, and that’s because you connected our computer to one of the early online services known as CompuServe. If I recall, I more than any of my brothers enjoyed it quite a bit and that was quite expensive. Edward: Yes it was, but it was learning and how do you hold back the rains or how do you handcuff the ongoing charge of education of learning. You cant.You can’t do that. It just doesn’t work. You can put a cap on it, but to put a limit? Uh‑uh. Ken: I remember on one hand, although you chastise me for the huge bills rising up, on the other hand, you tell your peers that your son was talking to people in Africa, in Europe, in Australia. Even before we had easy access to the Internet, in the world wide web, computers were already connecting people who would otherwise never had known each other. Edward: Never would it happened. That’s right. Ken: As you know, I still go to a convention for that Apple II computer every summer because those people I grew up with online are still friends of mine. Edward: You’ve got an international neighborhood. Ken: Nowadays, we almost all do. Edward: I know, that’s why things are evolving so fast it’s because at one time, your head will say, some scientists working in the little lab all by himself mixing formulas not knowing if I did this with that, what would happen? Where would be the effects of that? Will somebody on the other end of the Internet, he probably did it five years ago and he could tell you. Now you can. You can find out, you just look it up. Ken: The opportunity to collaborate is unprecedented. Ken: So before we even had an Apple II in the house, at least, that seems to be my recollection at the time want to maybe misremembering, we also had a pinball machine in the house. Edward: Yeah, that we did. Ken: Not every kid unless you’re watching the TV show Silver Spoon, it’s not every kid grows up with a pinball machine in their house. How did that happen? Edward: We were running in that nightclub wherein after they bring in, and you have a private company come in, they own the pinball machine and they would bring in a machine, those things even then where they cost were prohibited, they would set them up on your premises and you split the revenue. But after a while, six weeks, eight weeks, it became only half. You weren’t making, instead of 50 people playing in the night, they were maybe 25. Then there were 10, then there were five. Then it just set in at carpool. So that company would now take that machine out and bring it to some other place and start their whole cycle over again there but bring you in something brand new to this area. Ken: It’s like your comic books, it just kept swapping out old stuff and bring in new stuff. Edward: You got it. Yeah, so now when it ultimately just didn’t have any other place to put in my center one of the oldest I said, “What are you going to do with it?” Now, it goes into the jump file we use it for pots. I said, “How about the re‑having it, bring it to my house. What would you charge me and we negotiated the price?” That’s how it ended up in our sala. Ken: Did they even maintain it once it arrived at our house because I know people who today have pinball machines. I think even my cousin Ryan has one and there are literally miles of cables under the hood of these machines, they’re extremely complicated and intricate. Edward: These people, they would come and do it for me because I was a good customer of theirs, with their locations, if you will. Ken: At that point had you already become acquainted with pinball? Were you pinball aficionado that you would go to bars and clubs and just enjoy them for some downtime? Edward: No, not a bit. No, I didn’t. They never really appealed to me. Once they became that readily available, I knew that there would be another nice call it toy for you guys to play with in your own house. Ken: It was more for us than it was for you? Ken: Because if I recall my older brothers just like me, we all grew up playing video games. I’m the only one who still does to this day but they used to be quite good at this, weren’t they? Edward: Oh yeah. Obviously, we all remember your brother David with the Pacman, the pinball places used to actually pay him to not play that one game, because it was so very popular with all of the kids in those places. That if he got on, and he run it for several hours on a quarter, then they wouldn’t obviously make a dime on it. So they give him a bunch of quarters to go play another machine. Ken: That was basically extortion. Ken: Do I recall that there was some sort of a video game competition that my two oldest brothers were in? Edward: Down in Boston. There was some tournament and world of champions players for different games. They played in New York, San Francisco, Chicago, then they came to Boston and anyone that could beat their champions, there was $1,000 price. For whatever reason, Boston era in its environs was just chunk full of super champions and they beat the crap out of these guys. After one night, this world of champions, they were in the hall, for tens of thousands of dollars of other kids that had beat up including your two brothers, your two older brothers. The next day, they were going to have the playoff, they all went down there. The whole place would board it up, machines gone, them gone, you name it.That was the end of it. Ken: Rather than face the music, they just packed up and left town? Edward: Right, so I dig a deeper hole. Ken: One reason why my brothers were so good at this game is not just because it was the era in which arcades are everywhere, but also you used to bring us up to Funspot to vacation every summer. Edward: Yeah, absolutely. That was a nice place, too. Ken: It still is. It’s still there with all of the same games we had 30 years ago. I remember in my school cafeteria, when we get our little crates or cartons of milk, there would be a coupon on the side for free token at Funspot so I’d save them up all school year. In the summer, we go up there for a week. Ken: Thirty years later, it’s still there. It’s really quite genius what they did. I don’t know if it was intentional or not, but they never really got rid of their machines from 30 years ago and for a while, they would probably seem pretty outdated but now, they are literally a museum of all these games from a golden era. Edward: That’s very, very true. Ken: You just hold on to anything long enough and it comes back in a style. Edward: The second time around, that’s right. Ken: You may not have been an arcade player like my brothers and I were, but you definitely played games at home as you mentioned Snake Bite and there are a bunch of Atari and even Nintendo games that you used to play. Ken: What was it that attracted you to games? I have asked you what it was you liked about Star Trek and all these other stuff. What was it about video games that you enjoyed? Edward: The thing is, you got to remember now, I was using a computer in this infancy for actual work for accounting, some bookkeeping, spread‑sheeting, things like that. The computers have became a source of…it would make you tired and I would need a diversion, so then I found these other things to plug in or add on or whatever on to our computer that gave me that diversion. Now, I could have either that I wanted at the same place from the same machine as that’s how it came about. Ken: It probably made the computer more attractive and less intimidating if you knew that you could sit down in your work or play as opposed to seeing it as a work machine. Ken: What kind of games would you say that you enjoyed? You mentioned some specific titles but would you say that there’s a kind of game that you enjoyed? Edward: Obviously, towards the end here, I really enjoyed Tetris because that had very good eye and hand coordination. It required good eye and hand coordination. I never liked this role-playing games whatsoever that was…it just didn’t interest me. Ken: What do you mean by a role-playing game? Edward: Where you would be the good guy ad you would be going looking to slay the dragon and get quarters or whatever, things like that. It just didn’t interest me. Ken: So pretty much any game where there’s like an avatar on the scree. Something you’re playing as really? Or at least some sort of a person that you could identify with. Ken: You mentioned that my brother Dave liked Pac-man, did you like games like that? Edward: Yeah, I enjoyed that, that was fun. Ken: A lot of gamers, they like to build up these huge libraries of games. I myself have over a thousand. Every time I sit down, I can choose whichever one I want to play based on how I’m feeling that day or whatever. Whereas you, for the last 20 or 30 years, I observed that you would pick just one game and you play that one game for literally years without any variations. Edward: Yeah, I’m very boring. Ken: I don’t think it’s boring but what is it that prompts you to fixate on a game like that. Do you ever get bored, or are you trying to get better at it? Edward: Your proficiency can only reach a certain point and then, that’s it. If that isn’t the answer there, it’s just, it’s something that you know it, you enjoy it, and that’s like why I hate to change and upgrade computers or software programs, because now you have to literally learn all over again. The intricacies of that computer or that program, even if it’s just a knock of of the same, it’s replacing. If the one you have a broke, don’t fix it. Ken: So it’s the learning curve that you’re trying to avoid? You don’t want to have to figure out a new game, you just want to play it. Ken: So some other games I remember you’re playing over the years were centipede or millipede? Ken: We even bought you a special controller for the Nintendos, it was more like a joystick as opposed to a joy pad. Ken: Then, there was Dr. Mario and Tetris and I tried to get you into this other game called Tetrisphere but I don’t think either of us really talked to it as much as we did to Tetris. Tetris Attack came out I think around 95 with the Super Nintendo. As far as I know that’s been your sole game for 17 or 18 years. Edward: You got it, yeah, now I haven’t played it for probably four or five years. Edward: For some reason I just lost interest in all games to be honest with you. I don’t play any of those games. Ken: Even though you and mom are very much into your iPads nowadays and there are thousand of games at the iPad including a pretty good Tetris Attack clone, you don’t really see that as a gaming machine? Ken: Why is that? You just don’t feel the need for that diversion anymore? Edward: Probably. I’m just trying to wind up a lot of work stuff that doesn’t seem to have an end and doesn’t leave me any time for other stuff. Ken: Are you still using computers as much as you used to? Ken: So maybe that’s why whereas you used to be on the computer so much for work that you want to go use it for something else. You don’t really have a need for that balance anymore. Ken: Now I know mom is really into slots machine game on her iPad, is that something you pay as well? Ken: Because you certainly used to enjoy your annual trips to Las Vegas. Edward: Oh yeah, that was the real stuff. Ken: What kind of games did you play when you were there? Edward: You have them all. Top Dollar and Diamonds and…you name it. I play them all. Ken: So are those slots or are you talking card games? Ken: Were you also somebody who would sidle up to a card table and play? Ken: There’s quite the age range between your four boys, the oldest is 12 years older than the youngest. We all grew up with video games, but I seem to be the only one who still plays them nowadays. I recall certainly playing these games for hours and hours on then, you and mom never get concerned that maybe I was spending too much time playing them? Edward: Not really. No, some people brought that to our attention that you were putting in quite the amount of time but I just said, “Hey, leave it alone. It all balances out in the end.” Obviously, it has. Ken: When you say people brought it to your attention, who do you mean? Edward: Even like Annie Joyce or grandpa or different other associates of mine, they say, “Is he still playing those games?” Really plays a lot of them and I sit down, he enjoys it. If it works, don’t fix it. Ken: Of course that one have soften to more educational pursuits as I got older learning how to program the computer and the like. Ken: Now as a kid, you would send me to the same camp my three brothers went to which was primarily a traditional summer camp with PE and arts and craft. Did you ever think about maybe sending me to a computer camp? Did they even have those back in the mid‑80s? Edward: They don’t even have them at that time. It was that, no, that was to be in a consideration. Ken: Later when I went to college, I obviously ended up majoring communications but it was your encouragement that I pursued computer science initially. Why did you think that would be something worth pursuing when my older brothers all went into either business, real estate or law. Edward: That seemed to be a knack, or an exceptional talent that you had, compared to other endeavors, if you will. I was always the one that you follow path that you seem to have knowledge about, or we’ll say it comes easy to you, so I wasn’t going to push you into something you didn’t like. That’s the worse thing you can have. I don’t know if you remember that, but that seems almost contradictory to suggesting that I go major in computer science. Edward: That doesn’t mean that letting you go, or directing you into something else doesn’t mean that I can’t put my thumb on the scale, that I wouldn’t put my thumb on the scale to at least steer you into probably a more interesting aspect of the direction you were going. Programming, I still hold that opinion today about it. It is quite rote and repetitious, if you will. Ken: Where does that opinion come from, if I may ask? Edward: Probably from looking at computer programs that actually run different things, and seeing, you see, oh my God, it’s either very cumbersome, or very…and it’s always working towards being obsolete from the day it’s released. There’s always something new coming around the corner, especially today with algorithms, and everything like that. There’s always something better, get it going with more bells and whistles and things like that. Ken: I remember when I was still a junior in high school, you let me travel all the way across the country to Los Angeles to attend my first electronic entertainment expo, E3. Edward: That went on this week as we spoke. Ken: Yeah, that’s right. This marks the, let’s see, probably the 31st annual or even more so. Yes, that’s right, because I think it launched in ’95 when I went to the second one in ’96. Here it is still occurring every year. I’ve been riveted just sitting at the computer watching all the news and the announcements there coming out. Especially since so many games that they’re making now are sequels to games that I saw at E3, 30 years go, not 30, I’m sorry, I can’t do math, 20 years ago. But a lot of those franchises are still around and still popular. I seem to recall that it took some convincing to, especially to mom to let me as a high‑schooler fly across the country to E3 to stay with people I met on the Internet. Did you see this as a vacation for me or perhaps getting a jump‑start on a career? What was your motivation on letting me do such something so unusual? Edward: I looked at it as exposing you to a whole new era that was coming up worldwide. It wasn’t just something unique to that venue where it was, because you ended up meeting people from different countries for goodness’ sakes. You were even interviewing them in your newspaper enterprise, if you will. I thought that the experiences you would have there, it could never be repeated anywhere else. This was the place and the time to do it. It ended up being pretty close. Ken: Why is it that you think I still play video games when none of my brothers do. Even as you were telling me, we all grew up with this, my older brothers could play Pacman and Qbert for hours on the single quarter blindfolded and yet nowadays, that doesn’t seem to be a part of their lives whereas I look at my television and I have four different video games since I’m hooked up right now. Am I just immature for my age? Edward: Absolutely not. If you could look across throughout America’s living rooms, bedrooms, whatever, you would probably see people from the age of 60 and down with the same as hooked up as you do at your age. It’s not something that you have a monopoly on. You may think you’re the oldest or the only, but far, far be it. It went on. Ken: Oh, no. Actually, in fact, the average age of someone who plays video games nowadays is about 35. I’m pretty representative in that respect, but within our immediate family I would say I’m anomalous. Edward: I’m sure. You can play with number until the cows come home. There will always be some unique slot that somebody falls into just at that time or place, or whatever have you, but it doesn’t occur that often. Ken: The one person in our family, besides me, who played video games for the longest was you. You played Tetris for literally decades. Tetris Attack especially has a two player mode, but you never seemed interested in playing with other people. Why was that? Edward: I guess I just wanted to be the only game in town. When I played it was for just my own, singular pleasure, and not to go up against someone else. Ken: You saw going up against somebody as more of a competitive measure, as opposed to a collaborative one, or just a leisurely one? Ken: I mentioned how in the ’50s there was a moral panic over comic books, and as you know from my college senior thesis, this is a pattern that has repeated itself throughout youth culture, throughout the decades, rock and roll, Dungeons and Dragons, video games, etc. Video games nowadays, as the technology has progressed, they’re able to look much more realistic. Rather than having Pacman, who’s just a yellow circle eating ghosts, you can actually see rather life like characters engaging in some fictional, yet nonetheless violent acts. Even when I worked at Gamestop, by that time there was the requirement that certain games could not be sold to minors without a parent being present. Do you think that video games have a negative impact on youth, or have the potential to have a negative impact? Edward: Of course they don’t. Anything done to an extreme is, like you say, “Oh, I love apple pie,” you eat a whole apple pie you’re going to be one sick puppy on that last bite. Same with some of these violent games. You get into them, and the first hour or two it’s nice playing on that plane, if you will, and then all of a sudden it starts to absorb you, and your mindset starts to mimic what you’re doing on the screen, and what’s occurring on the screen, the different scenarios, and at some point you can lose that distinction between reality and fantasy. That’s a personal opinion of what is happening today. People, kids, grown ups, they’re all losing that distinction between reality and fantasy. Ken: What is the solution? Should we make fewer violent games? Edward: Well, now we’ve come full circle again. When you pass in a school newspaper, “Should we prohibit anybody from using a computer? Should it all be handwritten, or whatever have you?” I say you just have to let nature take its course, and see what happens. At some point, maybe if it is in a huge way going the wrong way, if you will, then it’s time to intervene, but not until then. You can’t start giving a person antibiotics every time they cough because you think it’s some huge cold, or whatever, and you have to intervene right away. You got to wait, and see how it plays out, see what new symptoms may crop up, then make a decision, and go from there, but not at every single cough. Ken: What do you do for fun nowadays? You don’t play games that much. What would you say is your prime leisure activity? Edward: Probably analyzing stocks. I enjoy that, economics, things like that. It can end up being a productive hobby, if you well, whereas at the end of a video game you turn it off, and everything that you’ve done before disappears. Whereas if you’ve been taking little notes about a certain company on how much its earnings are per year, per share and how many stockholders there are. If you’re writing it down you can put the newspaper away or turn the computer off where you’ve been researching it, you still got a record of it. If you’ve gone and made a purchase of that stock it could turn out to be lucrative, it could turn out to be worthless, who knows. Ken: The way you put it that when you turn the video game off everything disappears, almost makes it sound like a waste of time. Edward: How do you get that time back? Ken: You could never get time back no matter what you’re doing, whether you’re looking at stocks or playing a game. Ken: What you get out of a video game might not be as tangible or financially quantifiable as learning about the stocks, but there have been studies that show that people who read fiction, who read novels tend to be more empathetic because they have vicariously experienced all these fictional scenarios that they might not otherwise encounter. Ken: I would say as a kid growing up playing all these games, especially games like Final Fantasy, which was a role playing game where I’m going to this fantasy world and fighting dragons and finding these magical artifacts. Every time I turned it off I would run to you and I would tell you the story of everything that had just happened, because every time I turn the game back on, it picked up where I left off and I continue through this 40‑hour adventure. I really felt like I grew closer to those characters until at the end when the story was complete and I turned game off I missed them almost. Certainly not all games are like that. If you’re playing Tetris, that’s going to be a different experience, but even Tetris has certain…just like listening at a classical music can temporarily improve your IQ. Tetris can teach you certain pattern matching techniques or strategies. Ken: There actually was one more thing I want to ask you about. When I was a kid I went down into our basement where we kept all of our board games and our pinball table, and somewhere in that pile I found a box that had been given to my brother Dan as a gift at some point. He’d never done anything with it and it was the rules for a game called Dungeons & Dragons and I just fell in love with the ideas in this book even though I never actually played the game, just the concept of Dungeons & Dragons really appeal to me. You and mom picked up on that. When I was in second grade and we were headed to Disney World for the plane flight down mMm bought me a bunch of Choose Your Own Adventure books, but they were made by the creators of Dungeons & Dragons. That fostered my early love of reading and of fantasy novels and that’s the one that you picked up on a year later, because you were walking through the local mall and there’s a Walden Books there and there is this young local author who was doing a book signing for his very first book ever. He was a nobody at that time because he never have been published before and you picked up an autograph copy of The Crystal Shard by R.A. Salvatore. Edward: Oh for goodness’ sakes, I remember that. Ken: You brought that home to me in third grade and I tried reading it and I couldn’t, because it was too advanced for me at that age level. Then in fifth grade I tried it again and I loved it. By that time Mr. Salvatore had published sequels, so I bought all of those and I read everything with those characters and then that wasn’t enough for me, so I bought all the books he had written whether or not they had those characters. Then when I ran out of those, I bought every Dungeon & Dragons novel I could find. Then when I ran out of those I read every fantasy novel I could get my hands on. I’m not sure if you realized what you were doing that day when I was eight‑ or nine‑years‑old, when you bought that one book. I don’t know that R.A. Salvatore appreciates the impact that he had on my life of being the first person to get me reading or even with mom understood when I was in second grade the year before that she bought me those Choose Your Own Adventures. I still go to the library every weekend, I’m checking out fantasy and fiction and science fiction. Those small moments very long ago just you happen to be walking by as this new author is there had a lifelong impact. Edward: You never know what fate got for you coming down the road. Ken: Thank you very much for those small moments. Ken: Of course for indulging in all my video games and buying me a Nintendo and connecting the Apple II to CompuServe and then later on getting me an extra phone line so I can run my own Dial‑Up BBS, my Bulletin Board System. Edward: Oh yeah, that run for a few days. Ken: In fact, somebody just called me up a few months ago, he host a podcast similar to this one called Electric Dreams and he’s doing a research all about the history of BBS. He talked to me for an hour about this BBS I ran 20 years ago. Edward: Oh my goodness, wow. Ken: I would like to be remembered for what I consider important things I’m doing now and here is a guy saying, hey, I want to talk to you about something you did when you were 15 years old. He asked me all these questions and very often the answer was, gosh, I don’t know I was in high school. Ken: He even asked me, why did you use this software instead of this other software and I said, because the software I used was free and I was a teenager and I had no money. Ken: Yeah, exactly. Before we wrap up, we have several listeners who are people pretty much like me or maybe someday be old enough to appreciate the things that they grew up with and the things that their parents did for them, and they still have video games as a part of their life. Is there any advice or reflections on games, or just living in general and pursuing passion that you want to share? Edward: If there is something that’s old and you think is out of style and no longer has any value, don’t throw it out, put it away in some place special. Everything has a value someday, sometime. Ken: You never know what those touchstones of your childhood might be and when you dig them out years later, whether or not they have value on eBay they might have value to you. Edward: Exactly, yup, so hold on to it. Ken: I wish you’ve been listening to that back in 1988 when you got rid of my Atari 2600. Don’t worry, we ended up getting another one at a flea market a few years later. Ken: Wonderful. Thank you so much, Dad, for giving me this time. I really appreciate it. Edward: My pleasure, Ken, anytime. Ken: Thank you. I love you, Dad. Edward: Same right here, right back at you. We’ll see you, Ken. Ken: All right, talk to you later, bye. Edward: Do that. Bye bye. Woman: This has been Polygamer a Gamebits Production, find more episodes, read our blog or send feedback at polygamer.net. Ken: Hey, it’s working on the first try. Ken: Go figure, I guess we finally figured it out. Ken: How are you feeling tonight? Edward: Very good, very good. Ken: We finally have some consistently lovely weather today. Edward: Your mother and I were sitting out by the garage. Edward: Just enjoying it, it was so nice. Ken: Nice to see you’re getting some fresh air. Ken: Shall we pick up where we left off? Ken, I really enjoyed this episode where you interviewed your father. It’s great that you have this shared interest and bond over video games, and it’s nice that you took the time to record his memories of growing up. He sounds like a wonderful dad and person. Keep up the great work!